Reigning Eclipse Award winner Irad Ortiz, Jr. claimed the riding title at Gulfstream Park’s Championship meet, which concluded Sunday, besting two-time defending titlist Luis Saez, 135-134. Saez rode the winners of the third, fourth and ninth races Sunday to pull into a tie for the lead, but Ortiz came back to capture the 10th race to earn the riding title outright. 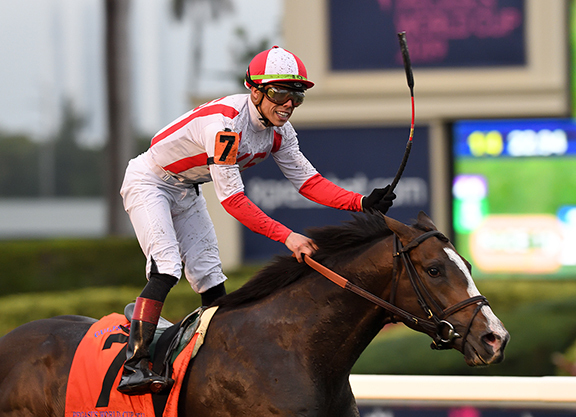 Riding full time during the Championship Meet for the first time, Ortiz captured nine graded stakes race, including the inaugural $7-million GI Pegasus World Cup Turf Invitational aboard Bricks and Mortar (Giant’s Causeway) Jan. 26. Trainer Jorge Navarro, who saddled X Y Jet (Kantharos) to victory in Saturday’s G1 Dubai Golden Shaheen at Meydan, captured his first Championship Meet title with 53 victories, breaking Todd Pletcher’s string of 15 consecutive titles. Pletcher finished second. 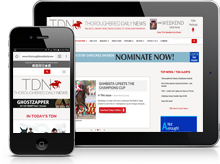 Navarro’s client Joseph Besecker was the leading owner with 19 visits to the winner’s circle. Live racing will return to Gulfstream for the start of the Spring Meet Thursday. First-race post time for an eight-race opening day card is set for 1:15 p.m.